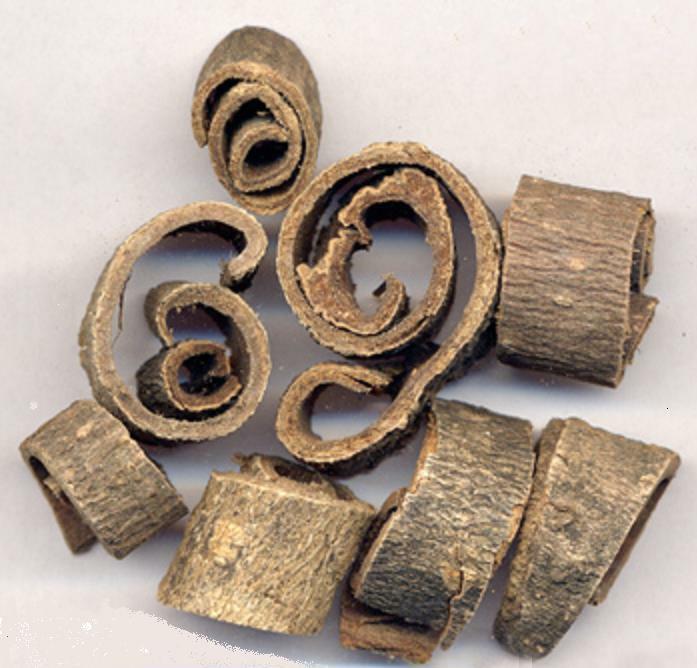 The dried bark or bark of branch, root of Magnolia officinalis Rehd. et Wils or M. officinalis Rehd. et Wils. var. biloba Rehd. et Wils of family Magnoliaceae. Sichuan, Hubei provinces, etc. in China. Collected during April to June. Fragrant, pungent, and slightly bitter. Thick bark, not roughness, heavy oil, with purple-brownish in the endothecium and shining crystal and strongly fragrant. Cut into pieces, prepared with ginger juice. Bitter, pungent, warm; spleen, stomach, lung and large intestine meridians entered. Dry dampness, move qi, relieve dyspnea. It is bitter and pungent in property, and can not only dry damp-turbidity but also move qi and relieve distention. For disturbance of qi movement due to damp obstruction of middle energizer manifested as gastric and abdominal distention, poor appetite, nausea and vomiting, it is usually combined with the dampness-drying and qi-moving herbs. For instance, it is combined with Cang Zhu and Chen Pi in Ping Wei San from Tai Ping Hui Min He Ji Ju Fang. It is fragrant in smell and is the essential herb for moving qi and relieving distention. For constipation, gastric and abdominal distending pain due to heat retention, it is usually combined with the purgative herbs and heat-clearing herbs. For instance it is combined with Da Huang and Mang Xiao in Da Cheng Qi Tang from Shang Han Lun. For disturbance of qi movement due to food stagnation manifested as gastric and abdominal distending pain, belching and acid regurgitation, it is usually combined with the digestant herbs. For instance it is combined with [Zhi Shi]] and Mai Ya in Zhi Shi Xiao Pi Wan from Lan Shi Mi Cang. It can dry dampness and resolve phlegm, drive qi downward and relieve dyspnea. For adverse rise of lung qi due to interior obstruction of phlegm and dampness manifested as cough, dyspnea and chest stuffiness, it is usually combined with the herbs of drying dampness and resolving phlegm, driving qi downward and relieving dyspnea. For instance it is combined with Zi Su Zi, Chen Pi and Ban Xia in Su Zi Jiang Qi Tang from Tai Ping Hui Min He Ji Ju Fang. For chest stuffiness, dyspnea, wheezing due to retention of phlegm in throat, and restlessness due to transformation of cold-fluid to heat, it is usually combined with the lung-clearing and dyspnea-relieving herbs. For instance it is combined with Ma Huang, Shi Gao and Xing Ren in Hou Po Ma Huang Tang from Jin Kui Yao Lue. For dyspnea and cough induced by invasion of wind-cold again, it is usually combined with the herbs of inducing sweating to release exterior, and ventilating lung to relieve dyspnea. For instance it is combined with Gui Zhi and Xing Ren in Gui Zhi Jia Hou Po Xing Zi Tang from Shang Han Lun. In addition, its actions of drying dampness and resolving phlegm, driving qi downward and soothing middle energizer can be used for the plum-stone syndrome due to combination of phlegm and qi. It is usually combined with the phlegm-resolving and qi-moving herbs. For instance it is combined with Ban Xia, Fu Ling, Zi Su and Sheng Jiang in Ban Xia Hou Po Tang from Jin Kui Yao Lue. Decoct 3~10 g, or ground into powder for pill and powder. It should be used with cautions for the syndrome of qi deficiency and fluid consumption, and the pregnant women.